So I have something to admit. Living as a renter out here in a maintenance-free home has softened me up to home improvement projects. Compared to living in Monona where I was spending an average of a couple of hours per week either pushing a mower, cleaning a gutter or painting a wall, the living out here is pretty easy. As a renter I am not expected to lift so much as a hammer to tack in some loose trim or to screw in a light bulb. The (tiny) front yard is all maintained by the HOA to private country club standards. The back yard is mostly rock and low-maintenance gardens. But I enjoy most home projects. Not the big jobs like tearing a bathroom down to the studs and rebuilding (I did that last year), but the small things that can make a big difference. 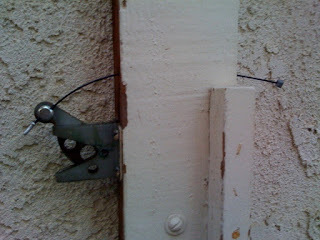 One of those very minor projects I tackled this weekend on the rental home was to repair the simple gate latches. Yeah, big deal, right? But as I mentioned above, it vastly improved our place since we were tired of reaching over the gate and jiggling a rusty and bent latch. So where do bike parts come in? Inspired by the gate I saw at my friends Don and Stacey's San Jose place, I hit one of the tub o' bike bits and grabbed a smooth Teflon-covered braided stainless steel brake cable and a cantilever straddle wire hanger nut and bolt to function as a remote. I'm thinking you should slap an old down tube friction shifter on to the end of the cable. You know, to give you something more substantial to grab onto.